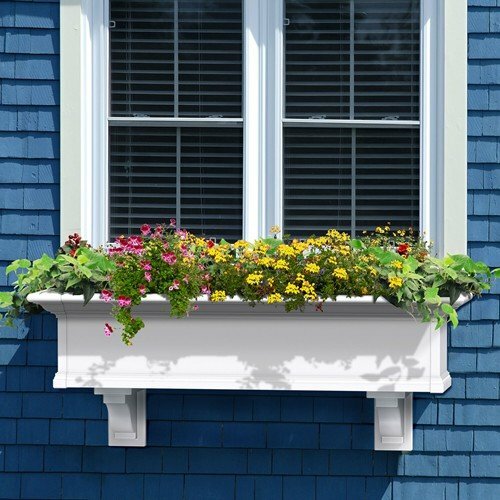 The Yorkshire window box helps you bring home the charm of the East Coast while offering a low maintenance solution. Compliment the appearance of your home with a product that cleans up with the simple rinse of a garden hose.Create amazing curb appeal with Mayne window boxes. With four styles and a variety of colors to choose from we certainly have a solution that's just right for your home. Our window boxes are molded with high grade vinyl and polyethylene and come backed by a 15 year warranty. Create a warm and inviting feeling with a touch of traditional charm.Sub-Irrigation System: Mayne window boxes & planters include a trough design creating a sub-irrigation water reservoir at the bottom of the planter. Capillary action allows water in the reservoir to soak upward keeping the soil and plant roots moist. To avoid oversaturation an overflow hole is molded through the floor of the window box allowing excess water to drain out from the bottom of the planter. Regular watering is required for the first few weeks giving the root system time to develop. Once the roots have grown down to the troughs the plants will be able to pull moisture from the reservoir creating a self watering effect. Includes two decorative "corbel" type brackets in matching color. Includes two decorative "corbel" type brackets in matching color. If you have any questions about this product by Home Wishes, contact us by completing and submitting the form below. If you are looking for a specif part number, please include it with your message.